Here at Who What Wear UK, we're all about delivering the latest and greatest shopping edits, as approved by our team. That's why we've created this offshoot shopping column as part of our We Try Before You Buy franchise, in which I'll be heading to all your favourite stores to test out new-in pieces IRL. From summer dresses to intriguing brands, prepare for changing room selfies aplenty. Is there something you'd like me to cover? Make sure to tweet or message me via Instagram for requests. I can safely say that I have an embarrassingly comprehensive knowledge of Oxford Street's changing rooms (Arket's have nice lighting and are roomy while & Other Stories' are always super clean, but that's a separate story). It's always interesting to compare the IRL experience of a store to its digital platforms. Generally they're consistent in terms of aesthetic, but sometimes there's a bit of a disconnect. This is what motivated my shopping subject this week. After a quick office survey, it occurred to me that many of my colleagues loved Mango's online offering of grown-up, stylish pieces. However, some found that the slick experience you receive virtually doesn't always match up to the IRL one. As someone who's up for a challenge, I decided to make a trip to the brand's Oxford Street branches to do a bit of shopping-based investigation. My findings were that it's best to discover the pieces you love on the website first. Then when you're in a store, ask an assistant for help finding them. Those expensive-looking gems are there, but they're probably hidden amongst other products. Also, take a look at the "last chance to buy" rail because this essentially acts as a ready-made edit of the most popular products around right now. Lastly, a quick changing room tip for the Oxford Street branch (the one next to Gap): Forgo the second-floor women's changing rooms and instead make your way to the top floor (next to the outlet), where there are rarely any queues. You're welcome. Hopefully these tips will help you have a more happy and productive Mango shopping experience, because once you get to the good stuff, the autumn collection is so chic. It's definitely up there as one of my favourite high-street collections this season: Think powder-blue suits, gorgeous checked brown coats and butter-soft leather separates. Mango's nailed its autumn colour palette. Scroll down to see my pick of the best new-season pieces. Style Notes: If you put this look in a lineup of designer suits, I honestly don't think I'd bat an eyelid. Aside from the stylish colour, I was really impressed by the fabric—it didn't have the shiny finish some high-street suits offer, and the weighty fabric meant it hung well. 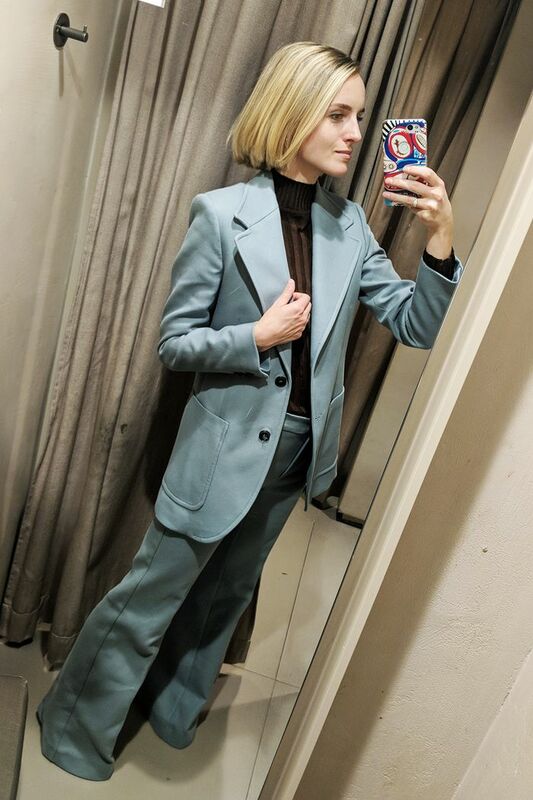 The only thing to note is that the trousers are super-long; I'm 5'7", and I'd have to wear heels to avoid the hems dragging on the ground (or take them up). Style Notes: I have so much time for this brown checked coat. In fact, I want to marry it and have its babies. It's all I could ever want from a coat; it's just the right amount of oversized without looking shapeless and the traditional brown checks look like an updated version of Harris Tweed. If you prefer a slightly more fitted silhouette, you should order a size down (I'm wearing a small). Definitely one of the Mango's autumn hero pieces. Style Notes: I feel very Great Gatsby in this flowing silk maxi. It's a little creased, but if it was pressed and paired with strappy high heels (my black loafers kind of work in a weird way, though) and a spangly clutch, I'd feel like a million dollars. The tasselled scarf detail (which is attached) is also a fun addition. Style Notes: This isn't going to win any awards for originality, but sometimes you can't go wrong with the classics. This cream-coloured cashmere roll-neck is so warm and will be a dream when the weather cools. Use it to layer up a summer dress, or pair it with a coloured suit. The trousers, meanwhile, play into this season's heritage trend, but unlike traditional styles, they taper out at the bottom. Style Notes: This has been a popular dress choice with the blogging crowd, and I can certainly see why. Red snakeskin might sound a little over the top, however, when paired with '80s-style ruffles in a demure, covered-up silhouette, it feels a little less flashy and a little more fashion. The dress is sold out online, but it's still available at ASOS and Debenhams (always remember to check other retailers for sold-out pieces). Style Notes: I love how leather has had a bit of a rebranding this season. No longer just confined to biker jackets and sweaty trousers (sorry, but it's true), it's now the subject of more refined pieces. Case in point? This shirt-and-skirt pairing made from the softest brown leather, meaning both pieces fit nicely around the body. Wear together for an easy, statement-making outfit. Style Notes: A small insight into the difficulties I encounter whilst putting together this piece: Shops don't usually let you take shoes into the changing rooms, so usually I just make myself stick with a pair I already own. Sadly, my Jigsaw loafers did not look good with this skirt, so I had to scuttle out onto the shop floor and surreptitiously slip on a pair of heels like some sort of terrible burglar. Anyway, it was worth it to get the shot, because I'm loving this sequinned midi skirt, which looks great when contrasted with a cosy knit. Perfect for smart-casual affairs. Style Notes: This silk dress alone was very Great Gatsby, but when paired with a leopard-print faux-fur coat, we enter Kate Moss territory (in the best way possible). It's all too easy for a high-street leopard coat to feel a little cheap, but there's something about the print and texture of this Mango piece that feels expensive. I'd consider ordering a size up for a more statement silhouette. Style Notes: Sorry if you're a little bored of cord at the moment, but the high street can't get enough of it (I also have a soft spot for the trend). Mango offers a few coloured cord suits in its autumn collection, and these pink trousers are one-half of a dusty pink two-piece. I like the wide-leg fit, which looks great with a sporty, slim-fit ribbed top.